This is the 16th post of a series. In my previous post, entitled “church: THERE. IS. MORE.” I drilled down to the core of the issue. Today, I’m clarifying something I think may have gotten buried. I said something in my previous post, but I’m not sure it came through. I need to try again. If you got it the first time, bear with me. 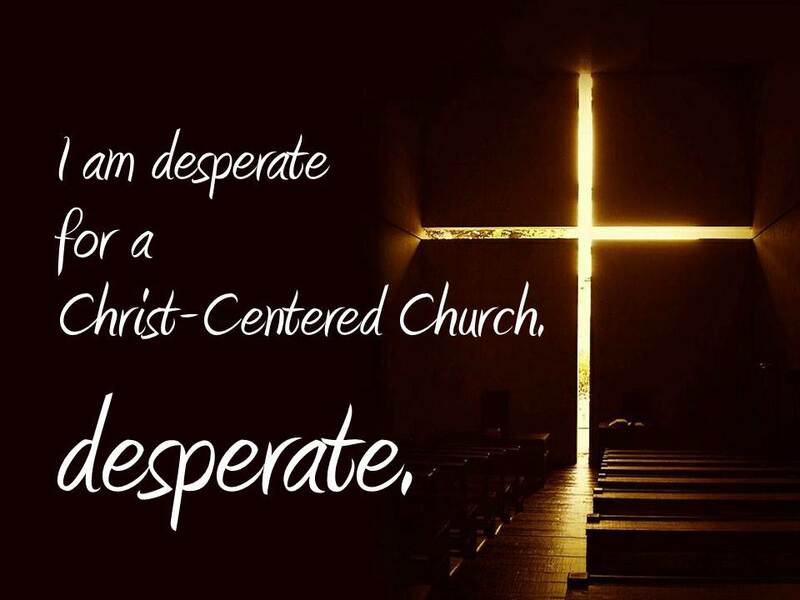 There are people in my church who understand what I’m saying when I talk about being Christ-centered. There are people in my church who are experiencing abundant life in Christ through an intimate relationship with Him. Are YOU one of those people? Is YOUR faith in Jesus at the center of your life? Are YOU experiencing abundant life in Christ through an intimate relationship with Him? But what about our churches? We profess belief in God. We pray to God. We give offerings to God. We learn how to live good, moral, Christian lives. We learn about discipline and character. We sing praise to God. We serve others in the name of God. We love each other. We support each other. We encourage each other. We help others. We serve others. We accept others. WE, as a unified body of believers, are not Christ-centered. WE, as a unified body of believers, don’t view the heart of the gospel as the foundation for everything we do. WE, as a unified body of believers, don’t even have a common understanding of what the word “gospel” means. To share the “good news” of Jesus Christ is to declare the excellencies of Him from every Scripture and perspective possible – NOT just the fact that He saves sinners from eternity in Hell. – because more often than they should, our affinity for each other, our acceptance of each other and our service supersede a shared acknowledgement that the greatest thing we have in common is our need for Christ. – because when we aren’t intentional, we tend to pray as body of believers who need and love God. In general. – I’m praying that a visitor would never leave our worship service without a clear understanding that we believe and worship the Father, the Son and the Holy Ghost, not just “God.” In general. – because I believe too often our love for Him motivates us to strive to live a good Christian life. So He’ll love us more? – instead of asking them how they came to our church, so we would have an opportunity to hear their testimony rather than just their church membership history. – as we provide for the temporal needs of others, I’m praying we also make sure we share how our discovery of the Bread of Life and the source of living water has changed our lives and given us the hope that is within us. I’m praying that OUR determination to do EVERYthing in the name of the Lord Jesus would be THE reason for each and every one of our programs. – not just some. I’m praying that even classes on personal growth, discipline and character development would be clearly grounded in Biblical wisdom and the concepts taught would be intentionally recognized as an outgrowth of our relationship with Christ. – because when we have unwavering confidence in Christ, we can begin to give without fear – and find JOY in the giving. – that we would seek and find the common thread that runs through the entire Bible so we can clearly recognize the Sovereignty of a perfect, all powerful, all knowing, ever present God. – because we never know who is listening or how God is moving in someone’s heart, mind and life that particular day. – and if something we are doing doesn’t evidence a commitment to Him or allow us to be witnesses for Him, we would re-evaluate why we’re doing it – and whether we should be doing it at all. I’m praying that as the body of Christ, our corporate worship services would evidence a deep commitment to and complete reliance on CHRIST. I’m praying that, in every interpersonal interaction, we would be witnesses to how we’ve been transformed by our relationship with Christ. I’m praying that witness would be crystal clear to any visitor who attends our Sunday morning services. That’s EXCELLENT. And you’re right. Absolutely, unequivocally RIGHT. None of it applies to YOU. I am NOT talking about YOU. As an individual. I’m talking about my CHURCH. As a body. Made up of many, many, many individuals. If, in that context, you understand and agree with anything in that list, then PLEASE PRAY WITH ME? That the HOLY SPIRIT WILL BRING REVIVAL to our church. NOTHING else. You can’t bring revival. Only the Holy Spirit can do that. God is Able. Prayer is more powerful than ANYthing we can do on our own. If you disagree with the things on the list, if you think I am flat out wrong, please…give me a few more minutes of your time. A few months ago, I took a quiz and I want to invite you take it too. Resist the tendency to answer as an individual. Step back. Try and answer as a member of your church. Even more difficult and uncomfortable? Step back even further. Try to look objectively through the eyes of a visitor and answer. 2. Powerful “thus says the Lord” biblical preaching where people have a distinct sense of hearing God speak with authority into their souls in a way that brings Holy Spirit conviction they cannot deny or dismiss. 9. Where the needs of the poor are met and those in prison are visited and aliens are welcomed as friends and strangers are served as brothers and widows are not neglected. Where these priorities are not a program or a phase but the lasting overflow of God’s abundance in our hearts. 10. Where all of these things are manifest. As in, everyone sees it and knows it and feels it and delights in it. Manifest means visible, obvious, undeniable activity that cannot be attributed to a person or a place or a program and is totally disproportionate to the ones who experience this abundance with overflowing joy as glory comes down when they gather. Add your boxes for a total that helps you evaluate your current Verticality. 40– 50 = A Vertical Church to the glory of God— keep it up and spread the word. 30– 40 = More Vertical than most— review the survey for areas of improvement. 20– 30 = Feeling the heaviness of your horizontalness? Much to follow in this book will help you. 10– 20 = Your honesty is good, but it’s time to get on your knees and deal with what hinders. 0– 10 = We will deal with your kind of church in chapter 4— God may have a new plan. Let’s just say I immediately skipped ahead to Chapter 4. And I didn’t have to do any math first. but over the last month, I would have to bump myself up to the 10 – 20 range. Because right now? I believe God is still moving. I’m desperately, persistently praying He’s not finished here yet. “…a huge difference— the difference between knowing the gospel and being consumed by the gospel, being defined by the gospel, being driven by the gospel. It’s one thing to see the gospel as an important facet of one’s ministry. It’s quite another to hold firmly to it as the centerpiece for all a church is and does, to completely orbit around it. …So here at this place of recognition and regret, we meet together to start a fresh journey into the heart of the gospel, prepared to be newly amazed by it, resolved to let its principles begin shaping how our churches worship, serve, and operate. This is the 16th post of a series. If you need to catch up or review, CLICK HERE to view a page listing all the posts in the series. ← church: THERE. IS. MORE.